It feels the way I imagine some streets in Shanghai might feel, and I would not be surprised if much of the Chinese you hear on 40th Road is the Shanghai dialect. 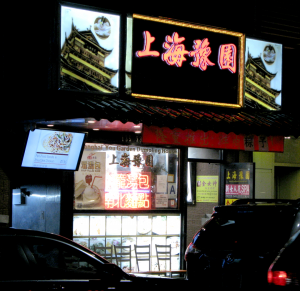 In any case, there are at least two restaurants that specialize in Shanghai-style food on this block. One of them, You Garden Dumpling House, is said by some to have better Shanghai-style food than you can find in most Shanghai restaurants. You Garden Dumpling House is ornately decorated, with white wood panel with Chinese characters carved in them suspended along the ceiling and wood screens with geometric designs that look almost Persian dividing the back half of the dining area from the front. Song style paintings of birds adorn the walls above every table. Three women man a traditional stove in which baskets of dumplings are sunk into open holes in the top, and a near army of staff rush about the wait station in smart black and red uniforms. 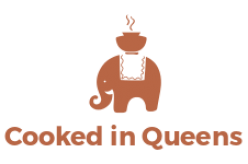 The menu is extensive, but has pictures and is helpfully translated into Korean, English, and Spanish. I ordered pork xiaolongbao—pork dumplings (baozi) steamed in bamboo baskets—and stinky tofu. A legend printed on my table mat helpfully explained that xiaolongbao are from Jiangnan, a region encompassing Shanghai. These little baozi are wonderful. Like Tibetan momos, they are filled with soup. 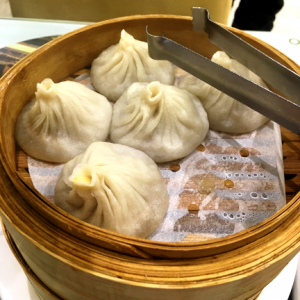 Apparently the soup is gelatinized pork broth—but at the piping hot temperature of freshly steamed baozi, the soup is a thin liquid, with a rich flavor that enhances the natural flavor of the pork. The stinky tofu earns its name. It has an odor resembling the odor of someone who hasn’t bathed in months. I am not sure exactly how this effect is achieved—apparently different regions have different methods of making the stuff—and I am not at all sure that this was Jiangnan style stinky tofu. But in general stinky tofu is made by fermenting tofu for several months. 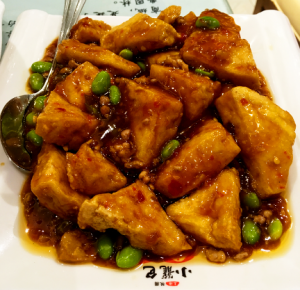 At You Garden, the stinky tofu is fried and smothered in sweet and sour sauce that is mildly spicy. Like most fermented foods, it has an interesting flavor, though it is not perhaps a wise choice for a main course. The waiters, magically attentive without ever really seeming to be there, surprised me with a free dessert as soon as I finished my stinky tofu. 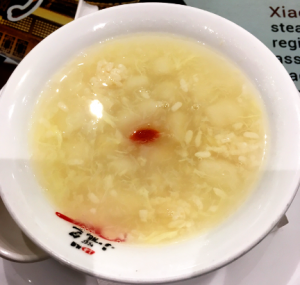 It was a whitish liquid with white spheres floating in it: hot rice wine with sticky rice balls. Wonderful.